Most recently Bobby's work was featured on Broadway in the smash hit revival of PIPPIN where he trained Tony award winners Patina Miller and Andrea Martin for their roles in the A.R.T. production, as well as Tony award Nominee Tovah Feldshuh who replaced Andrea Martin. Bobby was the tightrope trainer for Tony award Nominee Rob McClure and his two understudies for the 2012 musical CHAPLIN on Broadway. Off Broadway his aerial work was featured in the CSC version of A Midsummer Nights Dream starring Bebe Neuwirth and Christina Ricci. Bobby's career combines 25 years of theatrical expertise and 17 years of circus performance, to bring Aerial Dance to a whole new level! He's also the Cirque designer and coach for Holland America Cruise line and was the special affects designer for the band The Deafening music video "Dress You Up" starring Tony Award Winner Lena Hall. He trained and designed aerial acro for Erin Hill's music video "How On Earth". On New Years Eve 2012 Bobby and 16 other acrobats flew 75 feet to the roof of Madison Square Garden as part of the surprise gimmick for the rock band PHISH, traveling 18 feet per second in harnesses designed by Tony award winner David Gallow and Choreographed by Broadway choreographer Lisa Shriver. As an actor, Bobby has shared the stage with Lauren Bacall, Linda Eder, BeBe Neuwirth, Marge Champion, Cady Huffman, Nell Carter, Eileen Fulton, Kathy Lee Gifford, Kirstie Alley, and many more. Theatrical credits include the national tours of "A Wonderful Life" and "Cabaret". Regional credits include "42nd Street", "Singing in the Rain" "Kiss of the Spider Woman" and "A Chorus Line". A very proud member of Actors Equity Association and American Federation of TV and Radio Artists. TV Credits include 6 reality shows including- MARRIAGE REF, WIFE SWAP, FASHION EMERGENCY, MATCHED IN MANHATTAN, WHAT NOT TO WEAR, LALAS COURT LIFE, and he's also appeared on INSIDE EDITION, NY1, WNBC NEWS, WPIX NEWS, as well as Japanese and Brazillian TV as an aerial professional/artist. As a professional actor he often utilizes his aerial and circus skills when performing in musicals and shows that use aerial acrobatics. For the past 14 years he's worked as an aerial sequence choreographer. Staging 22 productions of the musical BARNUM, as well as training and sequencing for shows like AIDA, TARZAN (TOTS National Tour), CARNIVAL, THOMAS THE TANK ENGINE-CIRCUS ON SODOR, MADAGASCAR LIVE! and ANNIE GET YOUR GUN. He has former students performing all over the world. Including Ringling Brothers, Cirque Du Soleil, Disney, Sea World, Hershey Park, Busch Gardens, The Pickle Family Circus, Big Apple Circus, Cruise ships and Broadway. 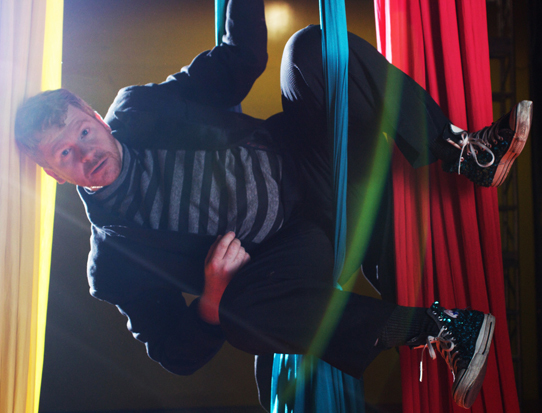 Bobby usually coaches privately, training circus professionals in aerial arts such as Spanish web, static and swing trapeze, cloud swing, aerial fabric ("Silks or Tissu" ), hammock, dance trapeze, Cord de Lisse, tight rope, and juggling. "I enjoy all aspects of height, flight and aerial dynamics. My philosophy is simple "Why Walk when you can fly?"